On Friday, Gov. Ron DeSantis unveiled his first budget proposal, dubbing it the “Bold Vision for a Brighter Future” budget. 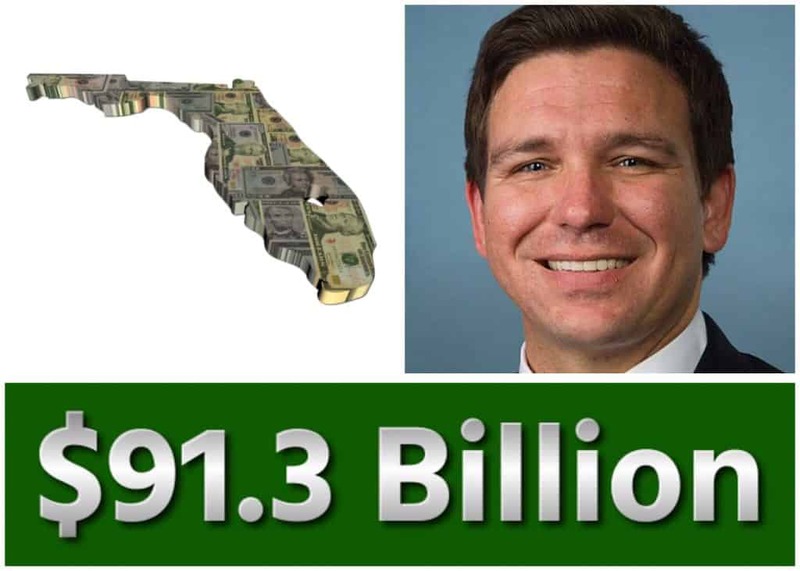 DeSantis is proposing a $91.3 billion budget of which $33.8 billion is for general revenue. “The General Revenue funds available for the Fiscal Year 2019-2020 budget year increased $1.0 billion from the previous fiscal year, a 3.1 percent increase. Florida’s total reserves are $5.2 billion,” the governors office noted. DeSantis insisted his budget proposal “is aspirational but also attainable” even as it builds from the $88.7 billion budget that then Gov. Rick Scott signed last year. DeSantis is looking to spend more on the environment and education. “Beyond the $360 million for Everglades restoration I have already outlined, I am recommending a $154 million investment in our prized properties, including $100 million for Florida Forever and $54 million to improve our state parks,” he noted. DeSantis also called to increase education funds by $224 a student as part of his $21.7 billion education budget proposal. This includes $50 million more in the Safe Schools Allocation and adding $10 million for mental health over last year’s budget. “School safety is an ever-increasing priority, so within our budget I am proposing $510 million in infrastructure construction and maintenance, including nearly $100 million to fund School Safety Grants to keep our students safe,” DeSantis noted on Friday. DeSantis also turned to hurricane recovery, a hot issue in the Sunshine State as parts of the Panhandle continue to recover from Hurricane Michael which hit that area in October. Turning to other matters, DeSantis looked at affordable housing, planning to “fully fund Workforce and Affordable Housing programs at $338 million” while looking to deal with Florida’s continuing problem with opioids. “Addiction relief and mental health are top priorities, which is why we are proposing $84.6 million to address the opioid epidemic gripping our state, as well as an additional $25.7 million to the investment last year for mental health needs,” DeSantis noted. Ready to deal with the Legislature for the first time, DeSantis sounded hopeful that he could work with Republican majorities in both chambers. “I look forward to working with the Legislature in the coming weeks. Together, we can empower Floridians and inspire their confidence by being responsible with their money, deliver necessary services and get government out of the way in the pursuit of their dreams,” DeSantis concluded. The business community’s leadership sounded an optimistic note about the governor’s proposed budget. “The Associated Industries of Florida applauds Governor DeSantis’ proposed budget and spending plan, which includes $335 million in tax cuts for Florida’s hardworking families,” said former U.S. Rep. Tom Feeney, R-Fla., the president and CEO of the Associated Industries of Florida (AIF). “Governor DeSantis campaigned on building a brighter future for Florida, and since the day he took office, he has set out to do just that. Already, he has made vital efforts to strengthen our economy, address our environment and science-based water quality projects, fuel hurricane recovery efforts, broaden technical and STEM workforce development; and now with the release of the budget, he is continuing to prove he means business. “We look forward to working with leadership in the Senate and House on behalf of the business community to ensure Florida’s employers and employees have a pro-business environment where they can flourish for years to come,” Feeney added.